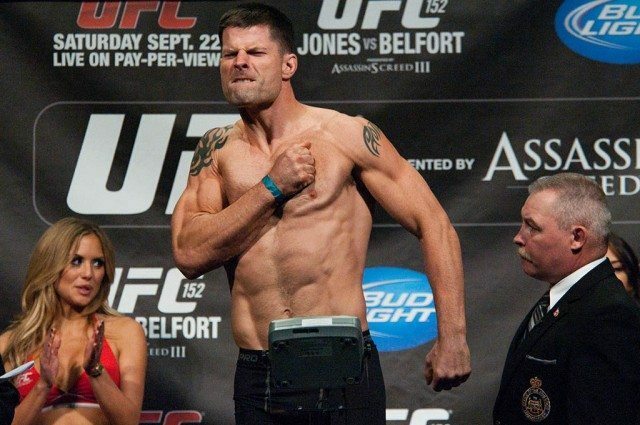 Brian Stann makes weight before UFC 152. Saturday, September 22, 7 p.m.
Tonight, the UFC will return to Toronto for the third time. The sport is relatively new to our province—mixed martial arts became legal in Ontario in August 2010—but as soon as it was allowed gears were set in motion to hold events in Toronto, and Ontarians responded by demonstrating their love for this controversial and often misunderstood sport. The first event held here (UFC 129, which took place on April 29, 2011 at the Rogers Centre) sold out in minutes, and became the largest regulated professional MMA event in the world. UFC 152 brings both excitement and controversy to Canadian MMA fans: rarely has a card featuring so much tension and drama been found anywhere. In several ways, UFC 152 in Toronto will be making history. 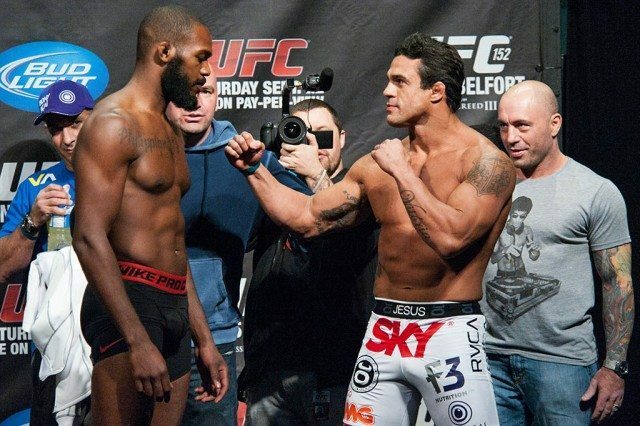 UFC light heavyweight champion Jon Jones (left) faces off against challenger and former champ Vitor Belfort. The event takes place on the heels of the unprecedented cancellation of UFC 151—the first ever for the UFC—which was to be held in Las Vegas on September 1. Current light heavyweight champion Jon Jones, youngest titleholder in UFC history, was scheduled to defend his title against Dan Henderson, who had to withdraw from the fight after he tore a ligament in training. UFC President Dana White offered two former champions the chance to fight, but they declined. Then, middleweight fighter Chael Sonnen offered to take the fight on a mere eight days notice; then it was Jones’s turn to refuse, on the advice of his trainer. As a result, the Jones fight was rescheduled for UFC 152 in Toronto, with former light heavyweight champion Vitor Belfort stepping in as the challenger. The reaction from both MMA fans and the UFC in the wake of the cancellation has been dramatic. The relationship between White and Jones has often been publicly volatile, with the two making conflicting statements to the press this week. Jones also seems to have lost some of his fans’ love in the process: during the weigh-ins he was loudly booed, while challenger Belfort was met with cheers and adulation, many fans waiving Brazillian flags from the stands. It is not only the drama of the Jones vs. Belfort match that makes UFC 152 a not-to-be-missed event: the card’s other main event is also a case of MMA history in the making, as Joseph Benavidez and Demetrious Johnson face off in the first ever UFC flyweight championship. (When World Extreme Cagefighting was absorbed by the UFC in early 2011, the lower weight classes gained depth and talent, and in March of this year the UFC announced that they would add a new weight class: the 125 lb. flyweight division.) Benavidez and Johnson are likely to put on an incredible show, as both possess astounding speed and agility, and have displayed tremendous amounts of talent and heart, succeeding for years in fighting in higher weight classes than was natural for them, often defeating much larger opponents. Joseph Benevidez (left) and Demetrious Johnson. The rest of the main card promises fireworks as well. Always-composed former marine and WEC light heavyweight champ Brian Stann faces off against outspoken English fighter Michael Bisping in a middleweight match that is already shaping up to be almost comic-book-like. Its pairing of the brash and insulting Bisping with the heroic and square-jawed Stann will be well worth watching. Light heavyweight Matt Hamill (the subject of documentary film The Hammer), is returning to the UFC after a brief retirement following a pair of losses to Alexander Gustafsson and Quinton “Rampage” Jackson. He will be squaring off against Canadian Roger Hollett, who has finally resolved a contract dispute with Bellator in order to take the fight. The featherweight match between Cub Swanson and Charles Oliveira (who came in slightly heavy at the weigh-ins) may end up taking fight of the night honours, as both men are vicious strikers. There is no love lost between Michael Bisping and Brian Stann, as UFC President Dana White separates the fighters at the weigh-in. The UFC 152 undercard also promises to offer a host of exciting fights. After a brief stint in the UFC, Vinny Magalhães was cut from the organization and then went on to win the M-1 Global light havyweight championship. However, after disputes with that company led to him putting his belt up for auction on eBay, Magalhães (who has also won gold in the ADCC) has returned to the UFC and wants to demonstrate that this is where he belongs. His fight is against Croatian fighter Igor Pokrajac. One rising star, lightweight Evan Dunham, will be looking to restore his position, but will face tough opposition from Canadian T.J Grant. Canadian welterweight Sean Pierson will be looking for redemption on home soil after a devastating KO loss to Jake Ellenberger in UFC 129; his opponent is Lance Benoist. Noted grappler and lightweight Jimy Hettes is sure to put on an excellent show against southpaw Marcus Brimage.